for 1-2 Age Made in China ..
Tricycle with a sporty and modern design. It features 2 modes of use. Push and go: the telescopic ha..
A sit ‘n’ ride car that offers 4 play modes to follow baby’s growth from 9 to 36 months. 1. Rocker:..
Аwеѕоmе bаbу саrrіаgе; Rеаlіѕtіс dеѕіgn; Wіdе аnd ѕtаblе tіrеѕ; Тurn thе .. Sit on your car and go to the adventure. The gurney is equipped with a trunk and has space beneath t..
Baby Walker and Activity Centre all-in-one, this item helps babies stand up and take those important..
Ages 6 months + Available in Bee and Hedgehog Soft rubber wheels Engaging textures and flexible a..
About the product: From teaching first words to encouraging first steps, the Fisher-Price Learn wit..
1. This is a multi-functional 4-in-1 ride on car 2. It is easy to convert 3. Just attach different..
Take a fun new ride on a colorful airplane with personality! 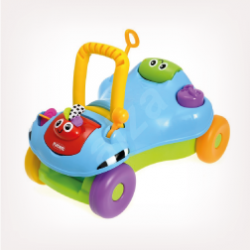 Packed full of engaging manual activiti..
Tricycle with a sporty and modern design it features 2 modes of use push n go the telescopic handle ..
Red Turbo Touch mini-vehicle, with 3 different effects: Two wheels, skid and horse. It also has load.. The new fleet of pull-back cars made awesome Small collection Cars By withdrawing recharge the cars,.. The new fleet of pull-back cars with great effects. Small, collectable cars. The car is charged by p..
Mini Collectible Cars:Three different personalities: Two-wheel effect, Handbrake (skid); And Cab..
Four amusing farm animals made in soft plastic, easy to grasp and shape to sharpen the first movemen..
Dolu Toys Dolu 2 In 1 Childrens Kids Indoor Rocking Riding Horse Pony With Wheels (Horse)2 in..
A sit 'n ride car that offers 4 play modes to follow baby's growth. 1) Rocker - suitable for sma..
It’s steady fun for your little one, with the Fisher-Price® Activity Walker! Folded flat, younger ba..